If you want speed, look for mass. Things closest to the Sun will tend to be moving the fastest. For example the Messenger spacecraft reached almost 63 km/s when in an elliptical orbit who's perihelion matched Mercury's position. 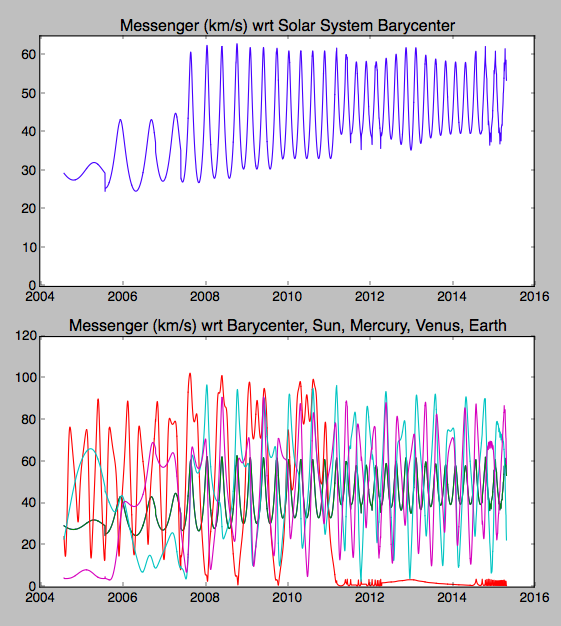 In the 2nd plot you can see the red line (speed wrt Mercury) drops to a very low value in 2011, that's when it entered into orbit around Mercury. I'm now looking for data for Mariner-10. I have estimated that In the future the Parker Solar Probe will reach about 195 km/s as it passes within a few million km of the Sun! Data below from JPL's Horizions. The only absolute limit imposed by physics is the speed of light, but with our current technology -- reaction engines based on Newton's laws of motion -- we're limited by practical engineering issues and Tsiolkovsky's rocket equation to speeds on the order of 1/10000 of the speed of light. I think it's useful to note that the whole concept of fastest velocity in space is some confusing. For example - altough Parker Solar Probe will be the fastest spacecraft even made, it will not have enough velocity to ever reach Mars from it's trajectory. Paradox? Spacecraft are not like race cars on track where the fastest wins. The better analogy are cars at a road in mountain region. The vehicle in a valley can have big velocity 120 km/h, but it's not enough to drive at the top of 1-km-high mountain by inertia only. Opposite, another car at the mountain's top can drive slowly 20 km/h, but it's total energy (kinetic + potential) is higher that the energy of the first car in the valley. If we drive the second car down from 1-km mountain without breaking, its final velocity will be insane. It's the same for spacecraft. The total energy (kinetic + potential) of a spacecraft tells us where it can fly and where can not, and how much time we need to reach our target. As far as I know the New Horizons spacecraft was the fastest ever space probe launched into space with a speed of 16.26km/s and there are other type of speed records held by Helios an Juno spacecrafts. Not the answer you're looking for? Browse other questions tagged spacecraft observation travel record speed or ask your own question. How to interpret and use characteristic energy C3 in this case? Which is the longest distance traveled by a space craft? How will the “fleet of small asteroid hunters” of the B612 Foundation & York Space Systems work?